Excel To HTML using codebeautify.org Nikon D3400 Digital Camera + 18-55mm + 70-300mm + 30 Piece Accessory Bundle HTML Layout using Tables, DIV, SPAN HTML Layout using Tables, DIV, SPAN Item Description The Nikon D3400 Digital SLR Camera has a 24.2MP sensor that captures pictures with amazing clarity. The 100-25600 ISO sensitivity is perfect for low-light shooting and fast moving subjects. Record family movies or dramatic films thanks to the 1080p Full HD capabilities. Use built-in bluetooth to pair your camera with your smartphone for easy sharing. Additional features: no optical low-pass filter, 3.0" LCD, 11-point AF system, 5 fps continuous shooting, plus more! 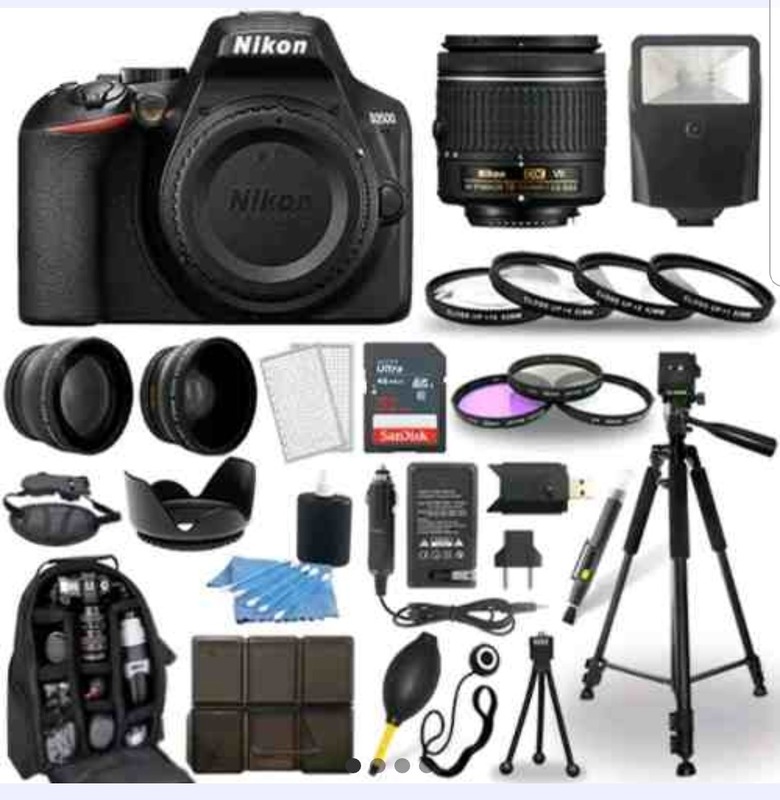 Item Includes Nikon D3400 DSLR Camera Body (Black) EN-EL14A Rechargeable Li-Ion Battery MH-24 Quick Charger for EN-EL14 Battery DK-25 Rubber Eyecup AN-DC3 Camera Strap (Black) BF-1B Body Cap HTML Layout using Tables, DIV, SPAN Kit Includes Nikon D3400 CameraNikon 18-55mm LensTamron 70-300mm Lens55mm 2X Telephoto Lens55mm Wide Angle LensSLR Backpack16GB Memory Card8GB Memory CardSlave FlashClose Up filter set3 Piece Filter KitTulip Lens HoodWireless Remote60 inch Full Size TripodTravel ChargerWrist StrapLens Cleaning PenDeluxe Dust BlowerUSB Card ReaderLens Cap KeeperTable Top tripod6 Piece Card Case3 Piece Cleaning KitScreen Protectors Nikon 18-55mm f/3.5-5.6G AF-P DX NIKKOR Zoom LensTamron 70-300mm f/4-5.6 Di LD Macro Autofocus Lens for Nikon AF55mm 2X Professional Telephoto Lens 55mm High Definition Wide Angle LensLarge Deluxe Digital SLR BackpackTranscend 16GB SDHC Class 10 Memory Card Transcend 8GB SDHC Class 10 Memory CardDigital Slave Flash with bracket 55mm 4 piece high definition Close-Up filter set55mm Multi-Coated 3 Piece Filter Kit (UV-CPL-FLD)55mm Hard Tulip Shaped Lens Hood (Black)MINI-INFRARED REMOTE CONTROL FOR NIKON60-Inch Pro Series Full Size Camera/Video TripodBattery Charger for Nikon EN-EL14 (Black)Pro Hand Wrist Grip Strap2-In-1 Lens Cleaning Pen (Black)Deluxe Dust BlowerUSB 2.0 Memory Card Reader Universal Lens Cap KeeperFlexible Tripod6 Piece SD/SDHC Memory Card Hard Plastic Case3 Piece Deluxe Cleaning kitUltra Clear screen protectors HTML Layout using Tables, DIV, SPAN Nikon 18-55mm f/3.5-5.6G AF-P DX NIKKOR Zoom Lens This AF-P DX NIKKOR 18-55mm f/3.5-5.6G is Nikon’s first and newest line of “AF-P” lenses. Lens is 3.1x normal zoom lenses covering the 18-55mm range of focal lengths (effective angles of view equivalent to those of a lens with 27-82.5mm focal lengths in FX and 35mm  formats). AF-P lenses realize fast and quiet AF operation via the adoption of a stepping motor to drive AF for fast and quiet autofocusing. Lens is compact and lightweight, DX-format compatible, 3.1x normal zoom lens with 18-55 mm focal-length range and f/3.5-5.6 maximum aperture. This lens has two aspherical lens elements that are employed to deliver superior optical performance with minimal lens aberrations. In addition, this lens has a compact and lightweight design with a retractable barrel for excellent portability. Compatible Cameras Nikon: D3000-series cameras from the D3300 and later D5000-series cameras from the D5200 and later D7000-series cameras from the D7100 and later D500 Note: Compatible cameras may require a firmware update HTML Layout using Tables, DIV, SPAN Tamron 70-300mm f/4-5.6 Di LD Macro Autofocus Lens for Nikon AF Compactness, light weight and affordability are brought together in the Tamron 70-300mm F/4-5.6 Di, giving emerging photographers an alternative to the highly lauded SP 70-300mm F/4-5.6 Di VC USD. Picture takers eager to bring distant sports or wildlife subjects closer, as well as bringing tiny, close range subjects into clear focus will appreciate the standout macro function, available at focal lengths between 180 and 300mm. Capable of a maximum magnification ratio of 1:2 (one half life-size) close-up detail fills the viewfinder. Also, because the macro function is available at the lens' longer telephoto settings, an extended subject-to-lens working distance is maintained. HTML Layout using Tables, DIV, SPAN 55mm 2X Professional Telephoto Lens The Telephoto Converter Lens brings distant subjects closer. The 2X Telephoto extends the focal length of the camcorder lenses 2.0 times, bringing things twice as close throughout the zoom range. This telephoto converter lens is perfect for long distance photo situations such as sporting events, portrait shots, as well as nature and wildlife photography. HTML Layout using Tables, DIV, SPAN 55mm High Definition Wide Angle Lens The wide angle lens widens the angle of view by multiplying the focal length of the camera lens. This doubles the angle of view making it an excellent lens for group shots or architecture. Improve the image composition of scenic views, and interior shots, especially when movement is restricted. The lens is supplied with a macro attachment that will allow for unsurpassed close up photography. This camera lens fits onto any existing lens system with a 55mm filter thread. Great for shooting sweeping panoramas, this wide-angle converter lens has the ability to dramatically improve focal distance capacity by fitting subjects into a frame. It also doubles as a macro lens, which makes this camera lens for ideal for taking extreme close-up shots too. Shooting with precision and clarity, this 55mm lens can be used for mid-range to close distances, such as landscape and macro photography. Furthermore, this wide-angle converter lens boasts of premium-rimmed, Professional High Definition glass designed to reduce glass flare and ghosting and ensure distortions do not become a problem. It is has a matte aluminum satin finish. Versatility and high optical performance makes this 55mm lens ideal for any photography setting. HTML Layout using Tables, DIV, SPAN Large Deluxe Digital SLR Backpack Full size back pack : This camera bag is the best camera bag for the on the go photographer. The case includes dividers inside the backpack which will give you multiple compartments to store all your cameras accessories with the camera included. HTML Layout using Tables, DIV, SPAN Transcend 16GB SDHC Class 10 Memory Card As high-tech gadgets become increasingly advanced with ever-improving video and audio quality, we find ourselves needing extra speed and memory capacity to store our high-resolution digital masterpieces. With this 16GB of storage, you can store your entire music or picture collection on today's high-megapixel digital cameras, HDTV digital video cameras, PDAs and other memory-hungry devices. Capture without limitation by pairing your digital camera and camcorder with Transcend's SDHC Class 10 Cards. Designed with the photography enthusiasts and videographers in mind, Transcend's SDHC Class 10 Cards can deliver high-speed performance at an affordable price. High-speed Performance Fully Class 10 compliant, Transcend's Ultimate SDHC Class 10 Cards use the latest flash technology to help maximize camera's response time, delivering an ultra-fast read/write transfer rates. This high speed performance is suitable for high-capacity photographs and high-resolution videos. Storage to Meet Your Needs Transcend's SDHC Class 10 Series come in a wide range of capacities to fit your storage needs. Whether you have a simple point and shoot or a high-end DSLR, it is the perfect everyday SDHC card to have during all occasions. Improves Response Time The industry-standard Class 10 rating guarantees a fast-performance that will improve your camera or camcorder's responsive time. This means even on your simple point and shoot camera, you can enjoy extended periods of continuous burst-mode shooting and HD video recording without lagging. HTML Layout using Tables, DIV, SPAN Transcend 8GB SDHC Class 10 Memory Card Capture without limitation by pairing your digital camera and camcorder with Transcend's SDHC Class 10 Cards. Designed with the photography enthusiasts and videographers in mind, Transcend's SDHC Class 10 Cards can deliver high-speed performance at an affordable price. High-speed Performance Fully Class 10 compliant, Transcend's Ultimate SDHC Class 10 Cards use the latest flash technology to help maximize camera's response time, delivering an ultra-fast read/write transfer rates. This high speed performance is suitable for high-capacity photographs and high-resolution videos. Storage to Meet Your Needs Transcend's SDHC Class 10 Series come in a wide range of capacities to fit your storage needs. Whether you have a simple point and shoot or a high-end DSLR, it is the perfect everyday SDHC card to have during all occasions. Improves Response Time The industry-standard Class 10 rating guarantees a fast-performance that will improve your camera or camcorder's responsive time. This means even on your simple point and shoot camera, you can enjoy extended periods of continuous burst-mode shooting and HD video recording without lagging. HTML Layout using Tables, DIV, SPAN Digital Slave Flash with bracket The Digital Flash is designed to work with most digital cameras on the market. It excels at providing natural-looking balanced flash exposures, compensating for the less-than-adequate built-in flashes found in many of today's ultra-compact digital cameras. The flash ships with a bracket designed to let you use your flash with virtually any compact digital camera that has a built-in flash -even those with no flash shoe. By using an existing shoe-mount flash with your compact digital or film camera, you can extend its flash capability, and take pictures at greater distances, with lower ISO settings, and often at wider angles, than is possible with the small built-in flash. The Adapter's bracket attaches easily to any camera having a standard tripod socket. specifications: Connection: to camera's hot shoe or camera's tripod socket through supplied bracket. HTML Layout using Tables, DIV, SPAN 55mm 4 piece high definition Close-Up filter set This 55mm Macro Filter Kit includes four close-up diopters at +1, +2, +4 and +10 magnification, and a durable carrying case. These filters simply screw onto the front of any 55mm lens, and will maintain resolution and picture clarity while magnifying image size. These lenses used to achieve macro-like photography when paired with almost any lens. The high-quality magnifying lenses are diopters for close-up camerawork; they work by shortening the close focusing distance of the camera lens. This allows the camera to focus closer to the subject and accomplish a larger image scale. HTML Layout using Tables, DIV, SPAN 55mm Multi-Coated 3 Piece Filter Kit (UV-CPL-FLD) These filters, made from the finest solid optical glass, are ground and polished to the most practical thinness. In addition, they are heat-treated to avoid any distortion or focal shift, and each filter is subject to strict tests in order to ensure a flawless, even surface, which is essential to a quality filter and exceptional photographs. Key Features: Fits 55mm lenses Ideal for protecting your valuable lens from scratches and dust UV filter absorbs ultraviolet rays to produce crisp, clear photographs Polarizing filter eliminates reflections from non-metallic surfaces, and increases contrast and color saturation FLD filter helps balance light in outdoor situations or where fluorescent lights are used Lens filters are translucent glass placed in front of a camera lens to alter or adjust the light entering the camera and to protect the camera lens. Lens filters improve photographs by giving photographers control over light and allowing them to emphasize the features of a scene that they consider most important. This particular filter kit is a combination of the three essential filters no photographer should be without. Filters are one of the least expensive accessories you can use to make big changes in the way your pictures look. UV Filters A UV filter is used to reduce UV rays from entering the lens and striking the film. Modern lenses often have UV protection built into them as well as digital sensors, however, UV filters are commonly used to help protect the surface of the lens from scratches, smudges, dirt and other hazards. Circular Polarizing Filters No camera bag should be without a polarizing filter, whether you shoot digital, color film, color slide, or black and white. A polarizer is different than most filters in that it is composed of two pieces of glass, mounted independently inside a round frame so that one can be rotated relative to the other. As it is rotated, it increasingly cuts out glare and haze. With an SLR, you can actually observe this change through the viewfinder. Polarizers reduce glare from water, glass, or any non-metallic surface. You can also use a polarizer filter to darken blue skies. FLD Filters A FLD filter (fluorescent light correction) provides the perfect solution for obtaining pleasing skin tones and correct color while shooting without a flash under fluorescent lighting. This filter gives true-to-life color rendition by removing the harsh yellow-green cast ordinarily resulting from fluorescent bulbs. When shooting under natural light, a fluorescent filter dramatically increases color saturation of subjects such as sunrises and sunsets. HTML Layout using Tables, DIV, SPAN 55mm Hard Tulip Shaped Lens Hood (Black) This 55mm Pro Series Hard Tulip Shaped Lens Hood prevents image-degrading lens flare by blocking stray light from striking the surface of the lens. It also assists in keeping moisture or wind blown debris off the lens. It protects the front barrel from the inevitable impacts against walls, door frames and other real life obstacles. HTML Layout using Tables, DIV, SPAN MINI-INFRARED REMOTE CONTROL FOR NIKON The Infrared Shutter Release simplifies taking group photos by enabling you to step away from the camera. It's lightweight and easy to use. Simply point the infrared remote control towards your camera, from up to 16 feet away, and press the button. Since you are not in physical contact with your camera, this remote will eliminate any chance of camera shake. This is especially useful for night time and low light photography, since the shutter will be open for longer periods of time. The Infrared Shutter Release will expand the functionality of your camera, and improve your photos. Features Thumb Activated Release Mechanism , Allows Picture Taking While Away From Camera , Compatible with "bulb" mode. HTML Layout using Tables, DIV, SPAN 60-Inch Pro Series Full Size Camera/Video Tripod Pro Series 60" tripod is perfect for both video and still cameras. It features foam padded upper legs and has a quick release plate for easy removal of your camera. It has non-slip swivel feet and one bubble level indicator. It comes with a convenient carrying case. It has 3-section aluminum alloy legs and a 3-way pan head and a heavy duty center pole bracket. It expands to 60" in height and collapses down to 22.5". It has an easy crank handle for the adjustable center pole. 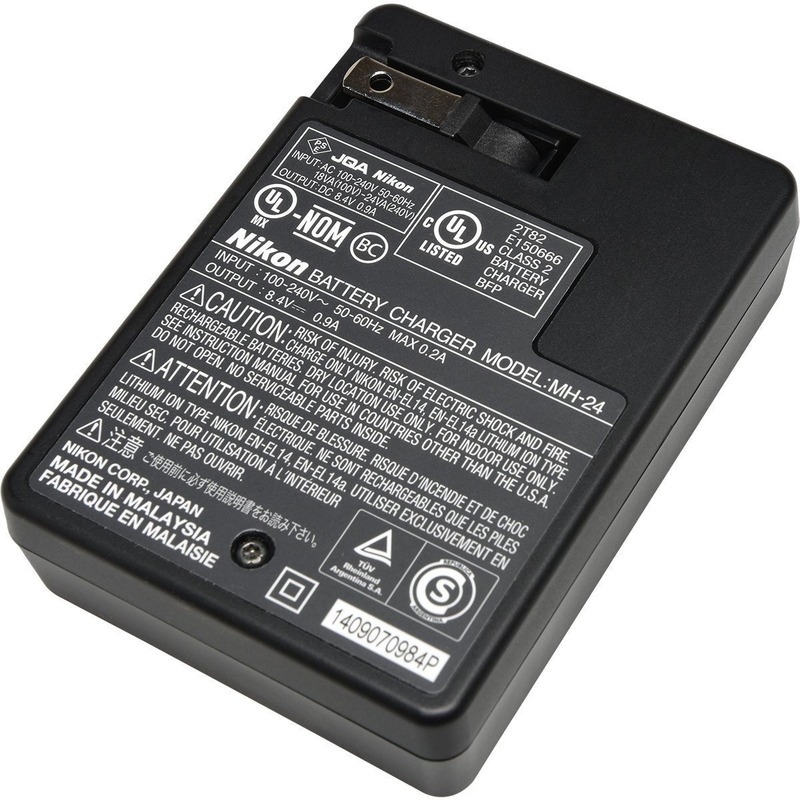 HTML Layout using Tables, DIV, SPAN Battery Charger for Nikon EN-EL14 (Black) This Charger for Nikon EN-EL14 Battery serves as a spare or replacement for your original charger. It runs on 110-240VAC power for worldwide use and outputs. The unit connects to an outlet via the flip-out North American plug or the supplied European adapter plug. 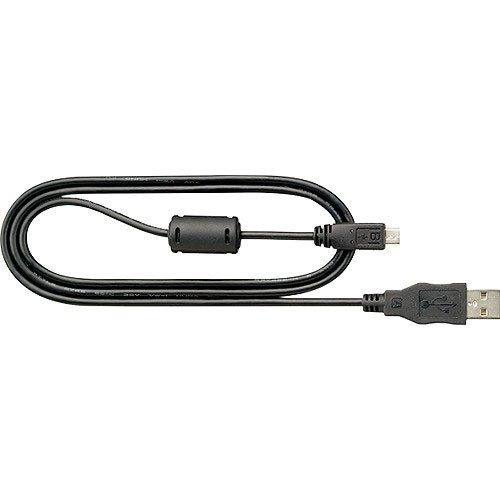 Additionally, a 12VDC power adapter cable is supplied, enabling on-the-go charging. The device is capable of fully charging the battery in approximately 1.0 hr, and features an LED status indicator. 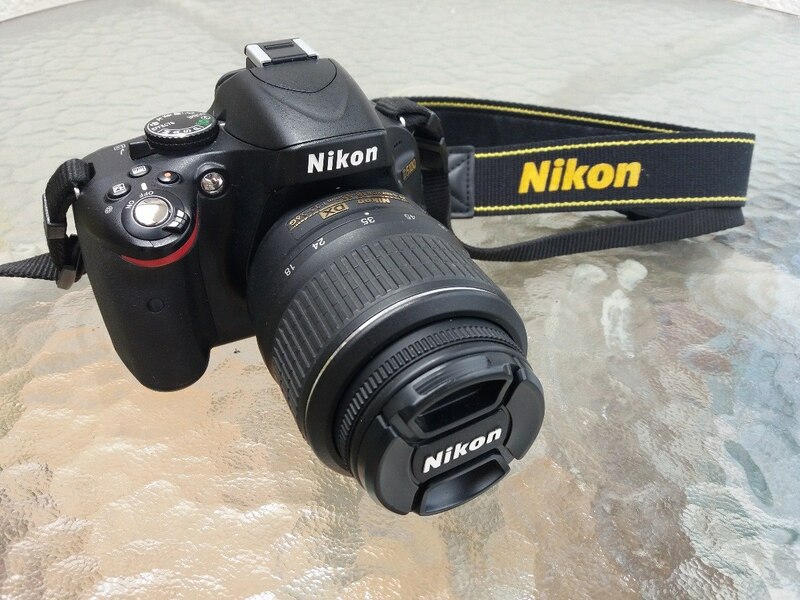 Fits these Compatible Camera Models: Nikon: D3100 D3200 D3300 D3400 D5100 D5200 D5300 D5500 D5600 DF HTML Layout using Tables, DIV, SPAN Pro Hand Wrist Grip Strap Secures tightly to your camera Prevents accidentally dropping your camera or camcorder Handgrip screws into the bottom of your camera Suitable for any hand size HTML Layout using Tables, DIV, SPAN 2-In-1 Lens Cleaning Pen (Black) High Quality 2-in1 Lens Cleaning Pen. Works with all types of cameras, (digital and film), as well as binoculars, telescopes, SLR lenses and other optical products. Environmentally friendly and non-toxic. The small pen style design easily fits in your pocket or camera bag. It features a retractable brush on one end and a spray cleaner on the other end. It also has a convenient clip to keep it in your pocket. HTML Layout using Tables, DIV, SPAN Deluxe Dust Blower This Dust Blower is Perfect for keeping your camera clean. Excellent way to remove dust off sensitive camera parts without physical contact. Safe for lenses, including multi-Coated Surfaces. Non-toxic. HTML Layout using Tables, DIV, SPAN USB 2.0 Memory Card Reader The high speed SD/SDHC/MMC memory card reader comes complete with a USB cord for added convenience. It works perfectly with your desktop or laptop computer. It is compatible with PCs & MACs. Ultra slim design and works with USB 2.0. HTML Layout using Tables, DIV, SPAN Universal Lens Cap Keeper The perfect way to keep track of your lens caps. A small button tapes onto the front of your lens cap and the elastic loop goes around the barrell of your lens so that your lens cap always remains attached, hanging from the lens. Never lose a lens cap again! HTML Layout using Tables, DIV, SPAN Flexible Tripod Flexible Table Top Tripod Universal Tripod Mount Pocket size For All Small Digital camera and camcorders HTML Layout using Tables, DIV, SPAN 6 Piece SD/SDHC Memory Card Hard Plastic Case A sleek, convenient case that holds 6 SD/SDHC cards. It fits in carrying in a pocket or purse for ease. Made of plastic for durability. HTML Layout using Tables, DIV, SPAN 3 Piece Deluxe Cleaning kit This 3 piece cleaning kit is perfect to carry in your camera bag. It includes 5 cotton swabs, a bottle of cleaning fluid and a soft-tex fiber cloth. HTML Layout using Tables, DIV, SPAN Ultra Clear screen protectors The screen protectors are perfect for digital camera screens, cell phone screens and game player screens. 3 pieces of screen protector are included with a squeegee card to smooth them out and remove air bubbles. They can be cut down to size to fit any screen from 1" to 4". Universal screen guard Supplied in 3 sizes for a custom fit Prevents scratching, wear and damage Helps to maintain LCD and camera warranty HTML Layout using Tables, DIV, SPAN TERMS & CONDITIONS When clicking the Buy-It-Now button or placing a bid you automatically enter into a legally binding contract to purchase the item. Please commit to buy only after you decided to purchase & you are ready to pay. A minimum 5% cancellation fee will apply to all orders that are not paid or returned for non-defective reasons. There will be no price protection, if the price of an item changes after purchasing. We are required to collect state tax from NY state buyers. HTML Layout using Tables, DIV, SPAN RETURN POLICY If you have received wrong or defective item(s), please ensure that items are returned to us within 30 days in original packaging in brand new and resalable condition. You will be required to contact us for a return authorization form before sending anything back to us. All returns must include original box, original factory packaging (foam plastic wrappings, etc.) Do not deface original factory cartons or packaging in any manner. We will not accept a return if the goods are not in its original condition. Do not discard box, until equipment has not been tested. HTML Layout using Tables, DIV, SPAN CONTACT US Whether you are just taking the time to view our products or a buying customer, you matter to us. Send us a message Sunday - Thursday 9:00 AM-7:00 PM Friday 10:00 AM - 2:00 PM Extended hours: 9:00 PM - 12:00 AM A RedTag Experience! Series Nikon D Screen Size 3.0"
Copyright © 2018 - Tuguruu.com México S. de R.L. de C.V.